This home study distance learning program is designed to aid those with a desire to learn Wing Chun who do not otherwise have access to a Wing Chun school or instructor in their area. It is also an opportunity for students of Wing Chun to become certified and recognized in accordance with the International Wing Chun Martial Art Association Ranking System, which is a key first step for those that wish to become IWCMAA certified Wing Chun Instructors. Individuals who wish to participate in the Online Wing Chun Distance Learning Program and become a member should complete the Training Program Application form below and submit the $65 Online Registration fee to the IWCMAA Headquarters in Wyoming, MI. You will also want to purchase the training materials required for the Online Course. 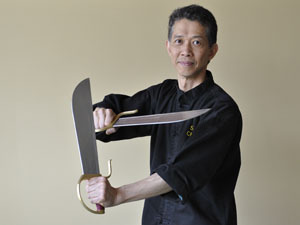 It is recommended that you purchase the IWCMAA Distance Home Study Course or IWCMAA Master Level Home Study Course, both of which include all the materials you will require to complete the Wing Chun Distance Learning Program and provide a cost saving over purchasing the materials one at a time as you progress. 1. Study and learn the required materials from the IWCMAA Sil Lim Tau Instructional DVD and download a copy of the level I test paper below. 2. Register for testing and pay the testing fee of $45. The test can be administered through emailed video files or video conferencing. All materials from the level 1 test paper will be examined. 3. Master Chan will critique and score your test. A passing grade of 75% is required to receive certification at the Sil Lim Tau level. 1. Study and learn the required materials from the IWCMAA Chum Kiu Instructional DVD and download a copy of the level II test paper below. 2. Register for testing and pay the testing fee of $45. The test can be administered through emailed video files or video conferencing. All materials from the level II test paper will be examined. 3. Master Chan will critique and score your test. A passing grade of 75% is required to receive certification at the Chum Kiu level. 1. Study and learn the Mok Jong sections 4 - 7 and related materials from theIWCMAA Mok Jong Instructional DVD and download a copy of the level IV test paper below. Note that this level of training requires access to a wooden dummy. 2. Register for testing and pay the testing fee of $55. The test can be administered through emailed video files or video conferencing. All materials from the level III test paper will be examined. 3. Master Chan will critique and score your test. A passing grade of 80% is required to receive certification at the Mok Jong level 2. 1. Study and learn the required materials from the IWCMAA Lok Dim Boon Gwan Instructional DVD and download a copy of the level V test paper below. Note that this level of training requires access to a Wing Chun Pole. 2. Register for testing and pay the testing fee of $65. The test can be administered through emailed video files or video conferencing. All materials from the level III test paper will be examined. 3. Master Chan will critique and score your test. A passing grade of 80% is required to receive certification at the Lok Dim Boon Gwan level. 1. Study and learn the required materials from the IWCMAA Biu Gee Instructional DVD and download a copy of the level VI test paper below. 3. Master Chan will critique and score your test. A passing grade of 80% is required to receive certification at the Biu Gee level. 1. Study and learn the required materials from the IWCMAA Bak Jom Dao Instructional DVD and download a copy of the level VII test paper below. 2. Register for testing and pay the testing fee of $75. The test can be administered through emailed video files or video conferencing. All materials from the level III test paper will be examined. 3. Master Chan will critique and score your test. A passing grade of 85% is required to receive certification at the Bak Jom Dao level.